For those of you who have followed my blog for any length of time, you know that I have recently started reviewing New Adult books. The genre is growing on me. As with all genres’, you have the exceptional books, the good books, and the bad books. A Chosen War falls somewhere between exceptional and good. Why does it fall between exceptional and good? Because I didn’t feel that connection with two of the main characters….which is important in books that I review. What also caused this book to fall exceptional and good was that the plot seemed to creep at points. 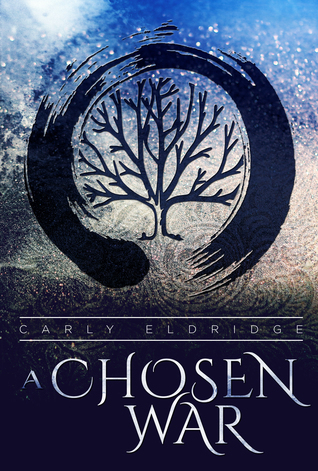 I think that A Chosen War did fit into the paranormal, fantasy, romance, and New Adult perfectly. I loved that there were guardians (or praeses) of the earth, animals, plants, air, water, and the moon with mythical guardians, called Talis, who guard the Council that watches over them. It was a perfect blend of mythology (angels, demons) and the author’s own imagination. The way that each praeses interacted with their environment was pretty cool. Blake was the praeses of the Sun, Leo was the animals, Reed was the plants, Lana was water, Poppy was Air and Selene was the moon. The ruler of them all was Gaia (Earth). Actually, the Sun ruled them all but Gaia co-ruled with him…if that makes sense. They were like the King and Queen of the praeses. Maia, I actually didn’t like at first. She was socially awkward, riddled with anxiety and really didn’t want to be the new Gaia. She even kept pushing Blake away. Well until Russia and then she did a 180…which drove me nuts. I understand that her past made her not trust people. Also, I didn’t like that the author started mentioning her past with her abusive grandparents and then just dropped it. Again, something that makes me go nuts. I did find the romance between Maia and Blake to be very cute but almost too sweet. Actually the romances between Leo and Lana, Reed and Selene, Poppy and Mac were the same way. Saccharine sweet. I did like that they were able to communicate without talking. Which was very helpful when Blake was living with Heidi because she couldn’t read his thoughts. Heidi was a bad, bad girl. She struck a deal with an unknown man (he wasn’t revealed until the end of the book). She was abusive towards Selene and decided to exterminate her replacements and succeeded until Maia. Put it this way, she was so bad that her powers were voluntarily leaving her and going to Maia….which is something that was unheard of. The end of the book was a cliffhanger, which I didn’t like. I do want to read book 2 because I need to find out about certain things/events.